It hardly seems like 12 and a half years ago, in January 1990, that Margaret and Michael Cemm were driving their brand new Mazda MX-5 through the hills of the Dandenongs, east of Melbourne, enjoying being among the very first people in the country to boast ownership of the sensational new roadster. It’s fair to say they were more than a little surprised to see a mini-convoy of two other MX-5s; one the pride and joy of Tony and Kari Esplin, the other owned by Tony’s business partner. All three were red, of course! With such excellent motoring taste in common, what could they do but stop for a coffee and chat about their new “babies”? First meeting: Michael Cemm is pictured right, in the cap, with Tony Esplin centre, as they posed after their first chance meeting in the Dandenongs. 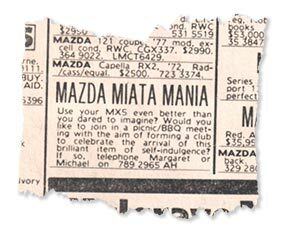 One thing led to another and, on 3 March, 1990, a small ad appeared in The Age calling for new MX-5 owners interested in joining such a club to contact the Cemms and get the ball rolling. Tony also contacted Mazda, which began the involvement with this fledgling “club” of Sue Ransom. As second-in-charge to Mike Quist in Mazda Australia’s national public relations department, it had been Sue’s job to launch the MX-5 in Australia, and her own plans for a set of Australian Mazda MX-5 clubs were well advanced. The Mazda-sponsored day was a huge success, with an overwhelming number of those present – many of whom had waited 12 months or more to take delivery of their new pride and joy – nominating in favour of forming Australia’s, and the southern hemisphere’s, first Mazda MX-5 club. A working committee was formed under Michael’s leadership to establish and incorporate the club, write a constitution, organise logos, badges, stationery, a newsletter and promotional collateral. When the new “MX-5 Club of Victoria” was born at Mazda’s South Melbourne head office on Friday, 10 August, 1990, it boasted 167 foundation members … one of the largest inaugural lists of any car club in Australia’s history. It got away to a flying start with a host of social and motor sport events befitting the smart new roadster. However, trouble struck soon after when the club and Mazda had a falling out and went their separate ways. The division intensified in the months following, when several members opted to form a second, company-supported, Victorian club, the “Mazda MX-5 Club of Victoria”, under the presidency of David Henry on 24 November, 1991 … the second anniversary of the MX-5’s Australian launch. It was a strange situation: two clubs of enthusiasts – one with Mazda support and one without – each celebrating the joys of MX-5 ownership and offering activities to bring out the best in the little car, but neither having anything to do with the other. Meanwhile, Mazda’s Sue Ransom was busy around Australia assisting the establishment of Mazda-affiliated MX-5 clubs in each of the other mainland States (Tasmania came under the Victorian club’s wing). It was during this period that the concept of a biennial “NatMeet” was formed, when Sue brought all the affiliated State presidents together for a gathering at Boomerang Ranch at Daylesford, west of Melbourne, in March, 1993. Grant George, SA president at the time, put up his hand for the Adelaide club to run the first national get-together over Easter 1994 – setting the high standard by which all subsequent NatMeets (NSW in 1996, Queensland in 1999, and Victoria in 2000) have been judged. The two Victorian clubs struggled on, each with annual memberships of around 60 or 70 owners, until late in 1994 when a core of people on both sides met for initial discussions which cleared the way for more formal merger talks that culminated in a joint meeting of the clubs at Trawool, in the heart of some perfect MX-5 country north of Melbourne, in July 1995. This meeting resulted in the new, united “Mazda MX-5 Club of Victoria Inc”, with Lindsey Howatt as president. The improvement in the club was immediate: suddenly more people were attending events, the united committee was working for much larger numbers, and the “new” club was much more viable and enjoyable. Convoys of 30 or 40 cars were not uncommon for weekend outings; motor sport events became more worthwhile and, with more people to share the workload, many more activities were run for club members. This new enthusiasm, combined with Mazda’s release of more limited edition versions of the roadster, the 1998 release of the “new” model, and more “pre-loved” models being available to a broader market, led to more people joining the club … and, importantly, staying with the club. Membership in 2000-2001 reached 281, and shows signs of being up around 300 again this year. The toils of the committees over the years has resulted in a privileged few being rewarded with Life Membership. The first was Margaret Cemm, recognised for her hard work in establishing the first club, with former presidents Michael Cemm, David Henry and Ian Morris, and 12-year stalwart Murray Finlay following.